Not since the introduction of the television have entertainment and media consumption shifted so rapidly. It’s easy to overgeneralize that this rapid shift in media consumption means that everything goes mobile (particularly for younger audiences). However research we released last week in our Getting Audiences Right report, shows that the real headline is the extent of audience fragmentation across both media consumption and shopping behavior. Nonetheless, this is not a disorganized fragmentation, rather we see that screen engagement coalesces around two organizing principles: the generation which an audience is a part of (we studied Millennials, GenX and Boomers) and the digital task which an audience member will perform. Generation is so important in how we understand media consumption and channel receptivity, because generation rolls up not only life stage events (career, children, and retirement), but also a set of beliefs that that cohort holds about itself (consider, for example, a 2010 Pew Research poll that asked audiences of these generations if they thought their own generation was unique, about 60% of Boomers and Millennials said yes, in contrast to half of Gen Xers). These life events and world views influence generations’ preferences for channels, devices, and even how they purchase. GenX is task-dependent and gender plays more of a role for men in entertainment consumption than any other generation (for example 68% of GenX men report using YouTube on a weekly basis compared to 47% of GenX women). Boomers, who often pride themselves in their facility with and use of technology (31% of them shop online via their laptop more than once a week and 18% shop online with their smartphone once a week) still prefer traditional channels for entertainment (cable TV is still the screen they’re most likely to watch on a weekly basis — 68% of women watch cable on a weekly basis and 62% of men). 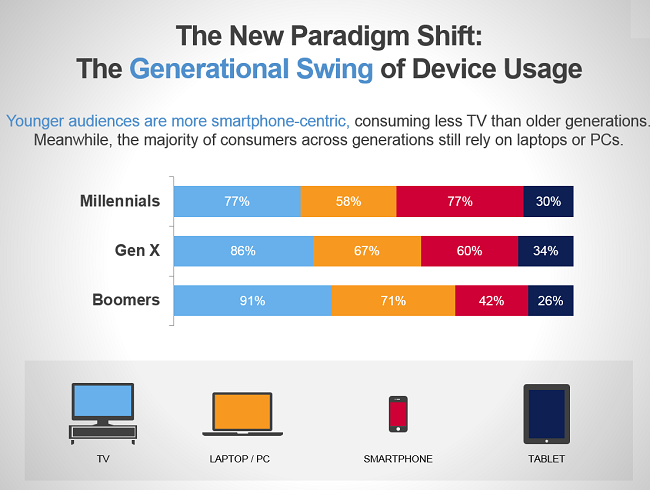 Nonetheless, in the consumer path to purchase, all generations lean towards PCs as the device of choice. GenX was most likely to use a laptop/PC for all purchase paths and were particularly strong adopters of laptops for the search or research of consumer packaged goods (49% of GenX had purchased or researched consumer packaged goods on their laptop in the past 6 months, compared to 27% having used smartphones for the same). Interestingly, GenXers use of tablets for CPG search/purchase was higher than that of other generations (20% of GenXers had used a tablet to research or purchase consumer packaged goods in the past 6 months). Finally, Boomers shared a preference for laptops (54% of them have used a laptop in the past 6 months to search/research consumer packaged goods, 46% for consumer electronics and 41% for researching or purchasing travel). All audiences stated that the primary drivers of their screen preference were screen size and the performance and speed of the device. However, our research also reveals that task time plays a large role in screen preference. Almost all audiences (81%) prefer to complete a five minute task on a smartphone. However, that percentage drops to 43% for tasks over 10 minutes. The marketers who are beginning to consider how time shifting and on-demand viewing affect their full communication plan will be a step ahead, particularly with audiences under 50 (GenX and Millennials). The use-case for YouTube may be easier to grasp as marketers begin to understand the elements of good pre-roll, but the marketers who understand the role of advertising and the type of advertising that is effective in over the top will have an advantage. GenX is the perfect generation for experimentation with a brand’s media mix, because GenXers still consume traditional television content (though more on cable than network TV), but have also moved to emerging channels like over the top (OTT). Given GenX’s omnichannel behavior, marketers must consider the ways in which messages can be sequenced across the channels. They must also be mindful of whether the content running on the channels ladders up to the branding objective for that channel. Even though mobile resonates with younger audiences, Millennials (and the emerging Gen-Z (audiences under 18) still lean to laptops for lower funnel purchase behaviors. Continued expansion of and investment in the PC/laptop consumer journey is still essential in achieving maximum digital ROI. 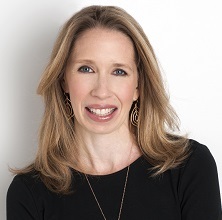 Joline McGoldrick is a Research Director at Millward Brown Digital. Joline was an early member of the Dynamic Logic Team, beginning in 2001 and is well versed in studying how audiences respond to Digital advertising. Joline is a product designer and marketer and a frequent speaker and panelist on understanding the digital audience experience. Joline’s work has been featured in Forbes, Adweek, AdAge, the Economist, Media Post, and Mobile Marketer and she has spoken at conferences including the ARF, MRIA, OMMA, MRMW, the Market Research Event and AdTech.